Head UGCC: "Institutions should not just help pupils get quality education, but also become better people"
The new Law of Ukraine about Education, which enables the Church and religious organizations to open schools, are useful. Because education and training are inextricably linked. True education is not possible without education on values and vital landmarks. For example, academic person can be dangerous offender if his skills and talents used for the destruction of society or for destroy the dignity of another person. Institutions should not just help pupils get quality education, but to become better people, that to build and not destroy. 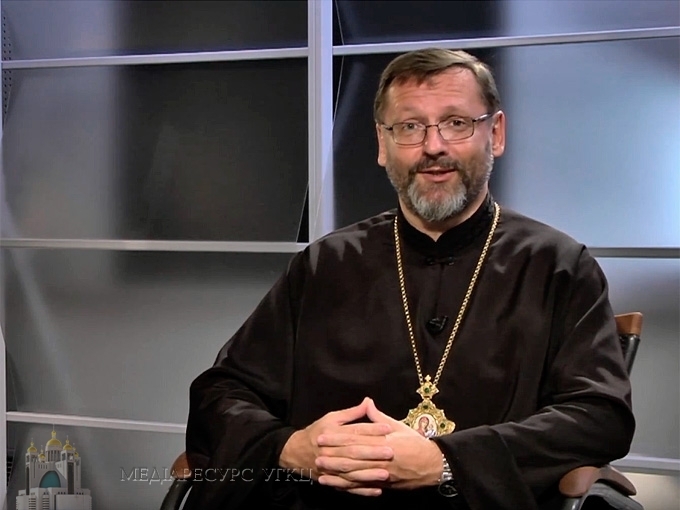 Said His Beatitude Sviatoslav on September 13, talking about education on Zhyve TV's project "Open Church". He said that presence of the Church in education is a guarantee that children in schools will be given common reference points. "When talking about basic values, for all Christian churches, they are the same, "- said Bishop. Such training, according to the Beatitude Sviatoslav, can be implemented in three stages. First you need to bring up a coherent person who can think critically, rather than simply reproducing knowledge: "That the person knows how to think independently and, even more, she could be free and responsible for their actions." The second stage - the education of a free man, a patriot, "that person could use for the good of the all people all that she gained during her education and training." The third stage - the person must develop his creativity: "Man must constantly study. School teaches to learn, and whoever comes out of it, must understand that he does not finish at this stage his education. " In this case, the Head of Church stressed that people must constantly learn new and meet the needs of society, "Then it will be always interesting to work in chosen field. A society that formed of such people will always be alive, open and creative. "